Sometimes when I'm asked to review a book I feel a little bit unsure about it, I mean, I'm not one of those influential and famous bloggers, so why in hell would they want me to review their book if it's any good. So yeah, sometimes I judge a book by how famous it is. Sorry. But this one surprised me, and in a really good way. At first I was attracted to it 'cause the title was cool, the cover looked cool and the story sounded cool. And well... It turned out to be a really cool book. It's a blend between fantasy, sci-fi and dystopia, and whaddaya know...! Those are my favorite genres! So I was a happy little reader. And although, I think it was usually pretty well mixed together, sometimes it felt like it didn't know exactly what it wanted to be, which made it a little bit confusing at times. But that didn't take away a lot from the reading experience, honestly. So, if you want to read an engaging book with an unusual plot, interesting characters, both main and secondary ones, and a refreshing feel to it, maybe this is the book for you. Jackson, a smuggler, lives in the shadows, once a boy with no memory, no name, and no future. 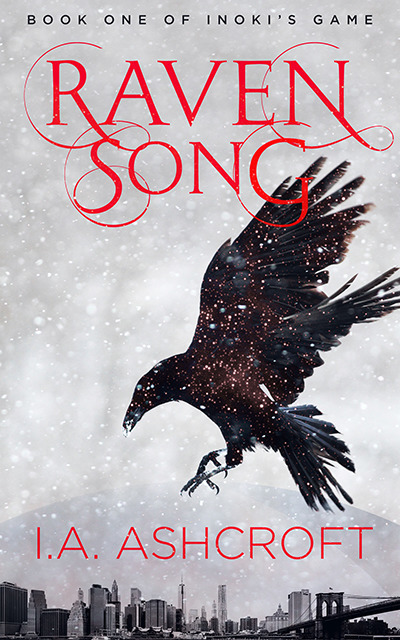 Ravens followed him, long-extinct creatures only he could see, and nightmares flew in their wake. Once, Jackson thought himself to be one of the lucky few touched by magic, a candidate for the Order of Mages. He is a man now, and that dream has died. But, the ravens still follow. The nightmares still whisper in his ear. Anna's life was under the sun, her future bright, her scientific work promising. She knew nothing of The Bombings, the poisoned world, or the occult. One day, she went to work, and the next, she awoke in a box over a hundred years in the future, screaming, fighting to breathe, and looking up into the eyes of a smuggler. Anna fears she's gone crazy, unable to fill the massive hole in her memories, and terrified of the strange abilities she now possesses. The Coalition government has turned its watchful eyes towards them. The secret factions of the city move to collect them first. And, old gods stir in the darkness, shifting their pawns on the playing field. If Anna and Jackson wish to stay free, they must learn what they are and why they exist. I. A. Ashcroft has been writing fiction in many forms for almost twenty years. The author's first book, written at age seven, featured the family cat, who befriended dragons and eagles, all while hunting an evil sorceress. This preoccupation with the fantastical has not changed in the slightest. Now, the author dwells in Tempe, AZ and writes almost exclusively in the realm of darker fantasy, loving to entertain adults with stories of magic, wonder, despair, violence, and hope. Ashcroft has a deep love of mythology and finding the story threads that resurface in humanity's tales over and over throughout the centuries, seeking to bring those elements into every tale penned. The author also loves diverse and intriguing casts of characters.